Over the past three years, I've been learning how to be a gardener - while at first succeeding only in killing most of my plants, I am finally making some progress. 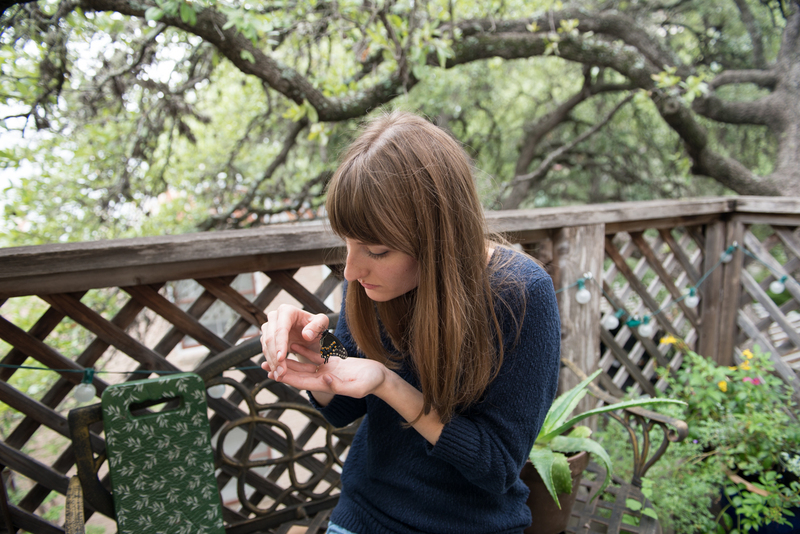 I started it all for the butterflies - to help them along in their journey down south. 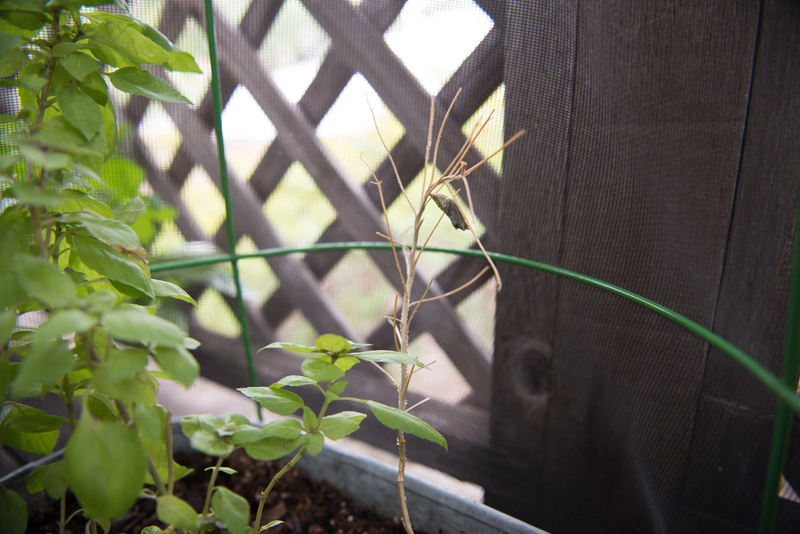 A month ago, a butterfly came to my balcony garden and laid a single egg on my rue herb. I was so excited, I immediately went to research what would happen next. 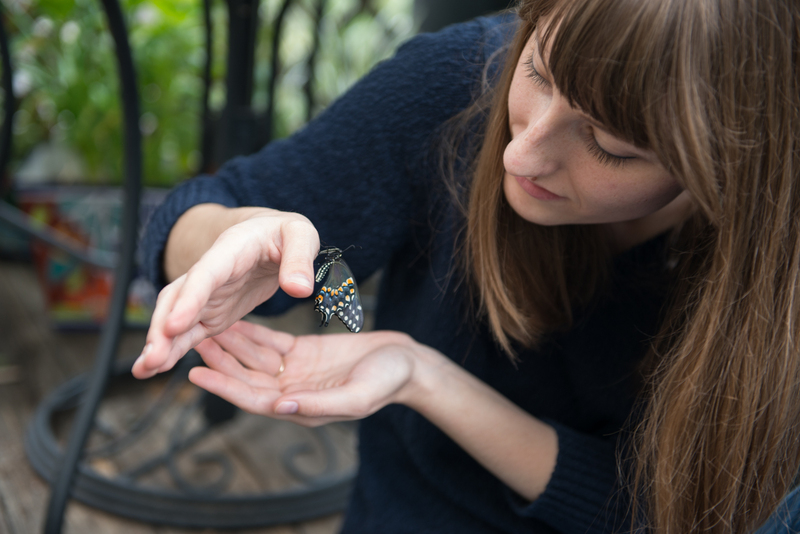 Here is a little bit about what I learned... Butterflies go through an amazing transition called metamorphosis. 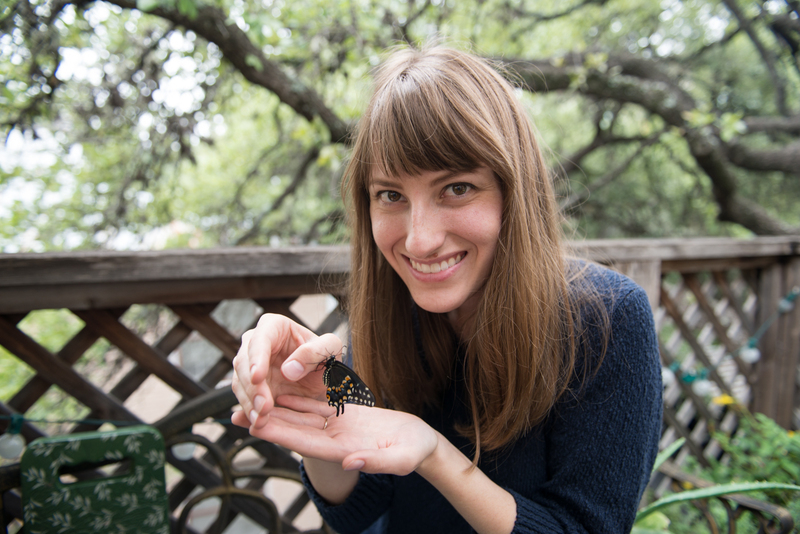 There are four stages a butterfly must go through - egg, larva, pupa, and adulthood. This first stage is what I was lucky enough to witness in my garden. Once the female lays her egg there is about a four day waiting period before it hatches. Butterfly eggs look like small yellow beads on the plant. 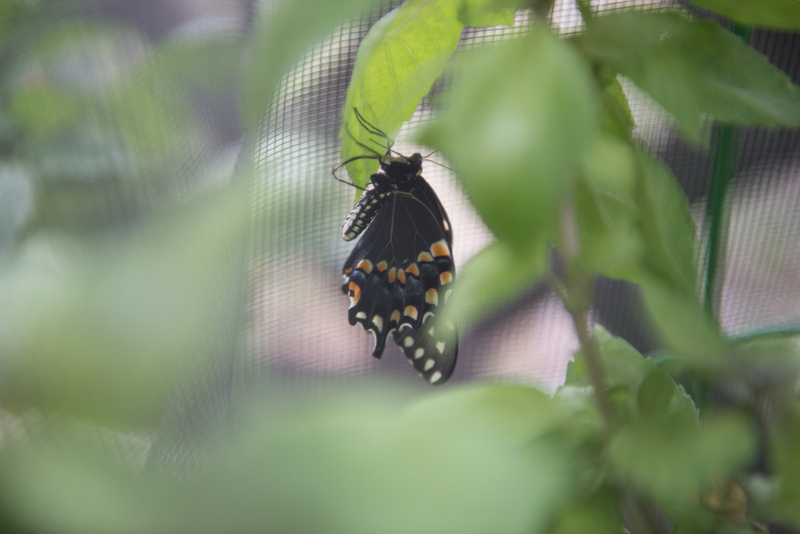 At this stage I wasn't sure, but I know now that this egg was going to be a Black Swallowtail butterfly. The next stage should be known as the baby caterpillar stage. They are just so cute and very small. As soon as they hatch, their only goal in life is to eat as much as they possibly can. This is when I realized that I had five caterpillars and not just one! They grow from that small bead to two inches long in only a couple weeks. Interestingly, the swallowtail has adapted to mimic the Monarch butterfly in color. They have white and black stripes with bright orange or yellow spots. These "toxic" markings help them to evade predators, but unlike the Monarch they are not poisonous. They shed their outer skin several times before they reach their final size. In the end, I had just two caterpillars make it and so named them Fred and Wilma. This is possibly the most interesting stage of change I've ever witnessed. Once fully grown, the caterpillar attaches itself to the plant and also creates a silk sling to hold themselves upright - this is unique among the swallowtail. They then begin to shed their bright outer shell one last time to reveal the chrysalis underneath. Fred did this first, and for whatever reason, Wilma wandered off to pupate elsewhere. After about two weeks (in our case it was three weeks), the butterfly cells have liquefied inside the chrysalis and reformed into organs, legs, and wings. 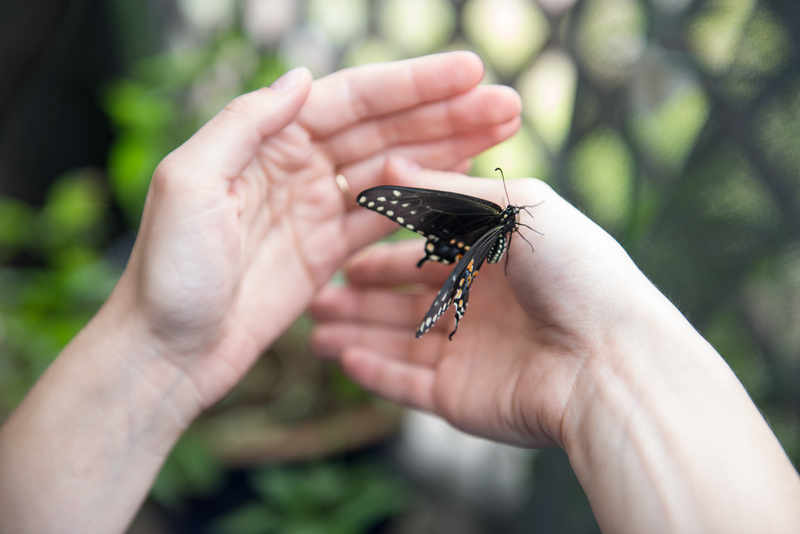 When they are ready to emerge, they turn from a bright green to a dark brown and you can begin to see the wings inside. Yesterday was the day that Fred decided to emerge, or enclose! 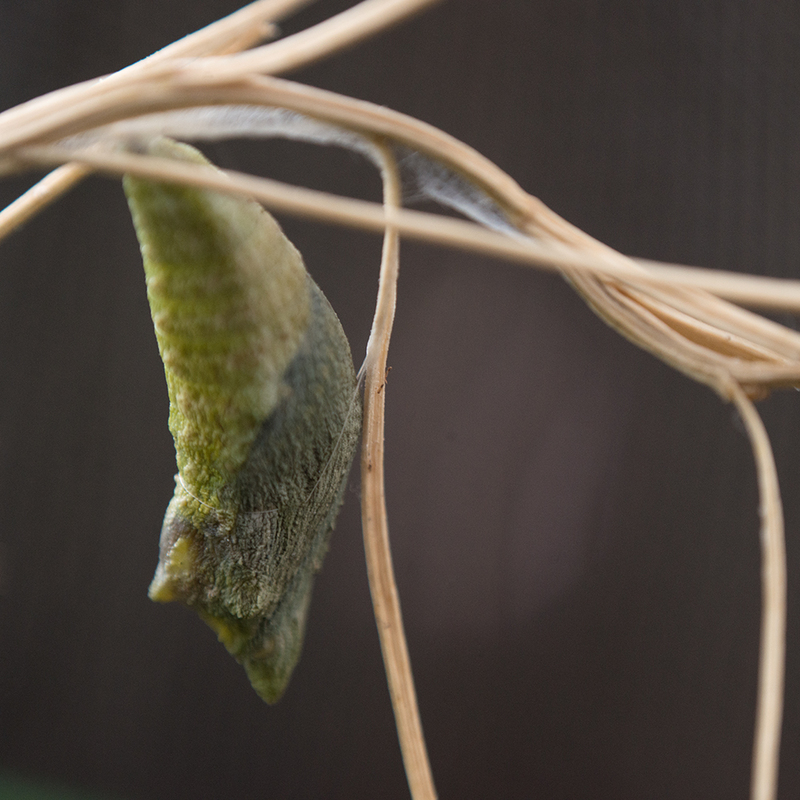 We came home from breakfast to find and empty chrysalis. We didn't see him at first, but then realized he was behind the Red Rubin Basil. We also discovered that Fred was actually Frieda the whole time. 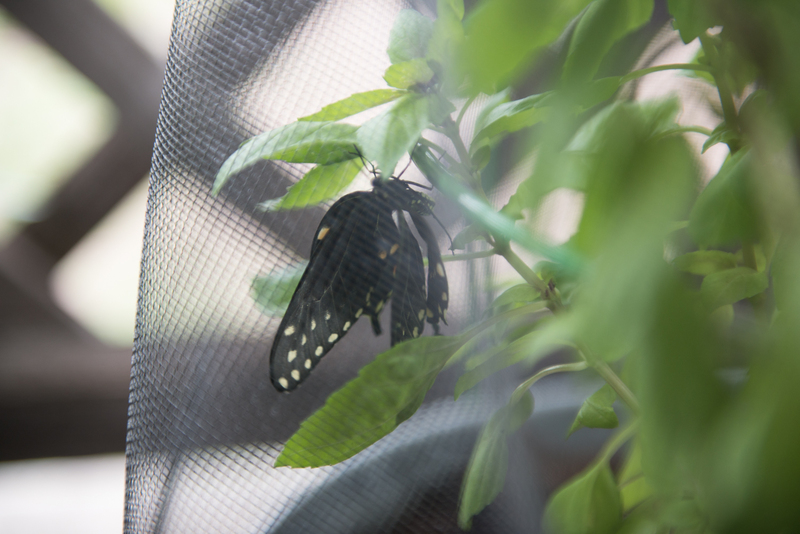 We have a female Black Swallowtail butterfly! 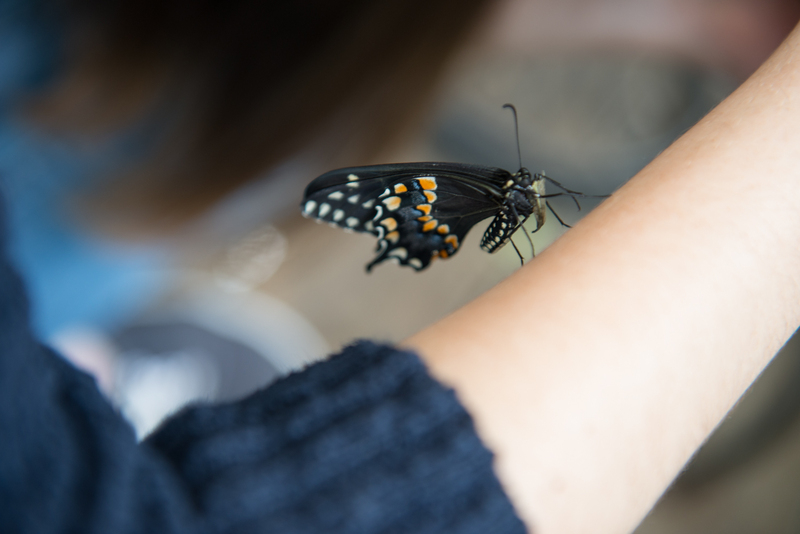 Once they enclose, butterflies have to pump blood in their wings before they can fly. Frieda made her way to the top of the basil herb, but we realized that part of her chrysalis was attached to her proboscis (this is similar to a mouth, it's a long tubular appendage that coils and uncoils to feed on nectar). After wetting it with some of the sugar water we left out for her with a q-tip and a lot of coercion Hannah and I were able to successfully remove the rest of her chrysalis so she would be able to eat. Unfortunately, she seems unable to coil it properly and we think there is some damage to it. It took us about two hours and even Frieda helped as much as she could to bat her new wings and use her legs to try and pull it out. Hopefully, she will survive this and be able to fly off tomorrow. For now she is resting the night on the basil. This has all been a great adventure and wonderful learning experience. It made all of the tears, aphid takeovers, polar vortexes, and midnight flash flood dashes out of bed and home from work to "Save the plants!" worth it.